Storytelling, a Powerful Connection between God, Parents and Children! Hello excellence seekers! I adore the “Towards Excellence” blog and know that, in its creator, Cecy Yepez, you are in great company on your journey toward a loving and generous life. I had the pleasure of meeting Cecy on a mission trip in San Lorenzo, Ecuador and she immediately became my Ecuadoran Pixie. At least in America, a Pixie is associated with being feisty, powerful, and beautiful. Cecy’s humor and wit are full of this feistiness and you can’t help but appreciate her for it. Her power comes from the One and only King of all kings and Lord of all. She never hesitates to remind others of this ultimate source of goodness and grace given to all who will accept Christ as their Savior. And beauty? Cecy is dripping with it. Her heart is full of such an incredible love for all people and, through it, she shares the journeys, stories, and truths of many. She prays on her words and how each story can help to affect His Kingdom for good. I am so honored to be a part of “Towards Excellence” and encourage you to support works of this spirit-filled nature. God bless you all! theater, forensics, public speaking, and writing, and she graduated early from high school to move away and pursue her dream of acting at age 18. She had a few small roles and a short stint on a local-based television show, but it was her day-job of working with Spanish speaking customers to take phone orders that paid her bills. Like many young dreamers, acting wasn’t meant to be for Reji, so she ended up joining the military where she proudly learned to be and served as an Arabic Linguist for the United States Air Force and National Security Agency. While in the military, she earned her degree in International and Intercultural Communications and she met and married her husband, Joe. The military had her family living and moving all over and she and her husband served in every community where they lived, in schools, kitchens, churches, scout groups, and local youth organizations. After seven years living in the greater Washington D.C. area, they were done with government and moved back to Wisconsin to continue raising their three beautiful children, Bradley, Kimberly, and Laura. 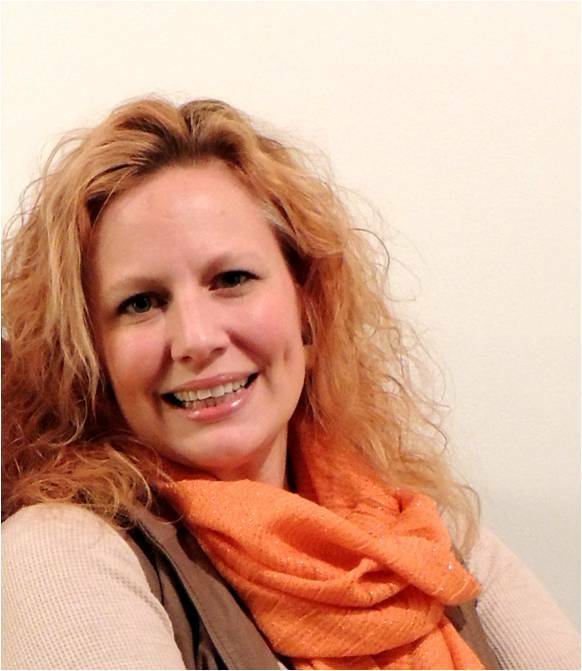 It was then that Reji took a small writing, speaking, and teaching business that she had always done alongside her many interests and various jobs over the years and turned it into her full-time career to create Reji Laberje Author Programs, LLC. Now, through her company whose vision it is to make far-reaching, positive impacts, and through her ministry work with children, marriage mentoring, small bible group leadership, local, national, and international outreach, the Alpha course (a 10-week class teaching the basics about Jesus and the Bible), and of course writing for many ministries, Reji and Joe, with their children and many pets, live an always active, but equally fulfilled life with Christ at the center. What do you think is the best way for parents to start teaching their little children to follow God´s path, the path towards excellence in life? In my opinion, parents need to be involved in the religious education of their children. They shouldn’t just bring their children to a church service or bible camp and be satisfied that their sons and daughters are taken care of by others. Instead, ask to serve or help in some way. Ask your children questions. Learn with your children. Take on the same challenges as your children when it comes to following God’s plan. As parents, we are still our children’s number one influencers. It’s not enough to just want them to love God when they are young. Loving God is something that can be very intangible for children to grasp. Loving us, though—people who are physically present—is something they understand. So, by us loving God and being a part of that education, the children are able to have that example to which they can relate. Do children naturally enjoy looking at storybooks? If so, how can parents take advantage of it and use creative resources to feed this natural interest, and help them to cultivate a lifetime reading habit of the Word of God? Reji brings reading, writing, and speaking education to thousands of elementary students across the U.S. every year to create a better world through better words. Here she is in April 2015 with students outside of Milwaukee, Wisconsin. grateful to slow down. Another part of me felt sadness in knowing that, for some of these students, they might not have ever had somebody simply read to them. I think, anthropologically speaking, we are built for storytelling. It is how we carry our history, including God’s history. We engage, naturally, not through interface, but face-to-face connections. I read the only storybook I could find in that classroom that day, but I think the children would have been just as engaged if I had picked up the daily newspaper. Our bible is filled with the most passionate and creative works ever. I tell my writing students that there’s nothing new they can write that God (and Shakespeare) haven’t already covered; they can simply bring their unique voices to the concept. I don’t think we need to get complicated about God’s Word, our children are built to engage in stories and God left us the greatest true storybook in existence. Pair the two and I think a natural love will occur. I think it’s incredibly important to bring a wide-range of literary choices to our children, particularly when they have access to so many subjects when they are outside of our presence. They WILL be exposed to a lot of the books (or movies, for that matter) that might not be our first choice for them. So, we should be the ones to discuss those books with them. Of course, the Bible is THE greatest book, but not everything my children (or I) read is biblically based, and that’s okay. I just remember to always bring it back to God. When it comes to fantasy, one of the things I personally enjoy reading and writing, I remind children that it is God who is the original Creator and aren’t we glad that he gave us such vivid imaginations. I try to steer toward those creative writers who have genuine biblical messages, such as C.S. Lewis. In those cases, you can tap into your child’s natural entertainment interest (fantasy, in this case) and also tie to God’s message for us. A single Google search for “Secular Books Christian Authors” will lead to countless other great books that will do the same as C.S. Lewis with regard to respecting God. However, there are also books that I and my children read which have zero biblical influence. That’s okay, too, as long as we are not reading something that is ANTI-God, as long as we have discussions about the books, and as long as the books are understood as fiction. My two daughters have read the Hunger Games trilogy and we discussed the parallels between it and our real world. We’ve also talked about the difference that would exist with God in that fictional Panem world of the series. At the end of the day, as long as you are having discussions about the reading taking place in your home, you—as the parent—have the ability to bring God to your children’s literature. Finally, please share with us a personal experience. How have well developed materials helped parents or even teachers to guide little children into God´s path, the path towards excellence in life? While my primary written works consist of books for children and young adults, as well as collaborative biographies, I also have curricular material as that pair with my live writing programs and in the form of advisory courses for kindergarten through twelfth grade students. A model that is common to follow when creating these materials is the 5-E Model (Explore, Explain, Extend, Engage, Evaluate). When Reji has book signings and events, she makes sure each child gets some one-on-one reading time with her. 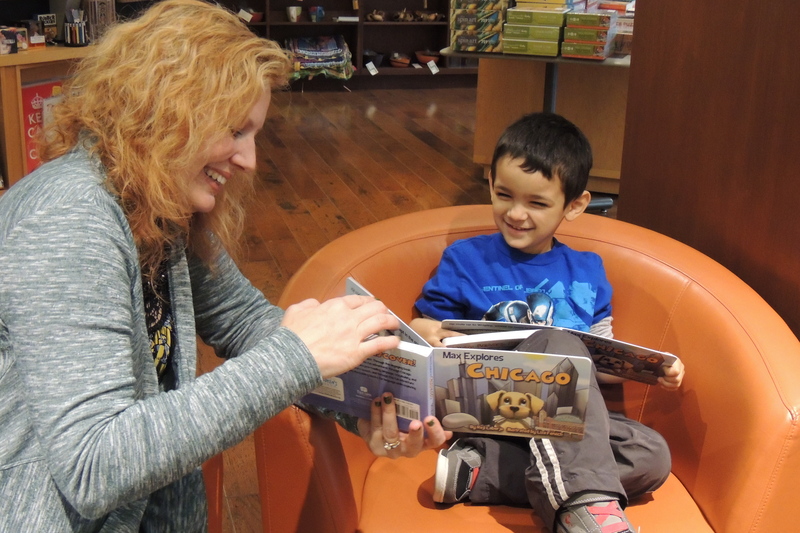 She and this young boy from Chicago enjoyed “Max Explores Chicago” together at Barbara’s Bestsellers in December 2014.
relate to the work or lesson. Extending brings in other resources (and the internet is a great tool for extending). Engaging takes place through some sort of hands-on application. This can be a game, activity, art project, or even a traditional report. Evaluating is communication about how that engagement reflected the work or lesson. To Christian work, when I write those lessons and that material, I add an opening and closing “E” that include Enjoying His story, where I bring in additional biblical references, and Exemplify through which we ask the question about how, as Christians, we can be an example of God with regard to the work or lesson at hand. You will find that most published bible studies have all of these elements in them. They may not call them 5 (or 7) E lessons, but there are opportunities to take in the Bible, discuss it, bring in a practical life example, give an exercise to apply the biblical lesson, and look deeper into oneself to see if the outcome is biblical. The best studies also include additional verses (like the added Enjoying His story E) and suggestions for HOW to live God’s word in everyday life (Exemplify). Look for materials that go beyond singular opinions following a verse. There should be a means to CONNECT to God’s word in the materials that you choose to use for teaching it. You don’t have to be a teacher or a writer to use this model. As a parent, you can take these same steps toward excellence in Bible teaching. The idea is that we shouldn’t make the reading of a verse or chapter the beginning and ending of a lesson. God’s word, in all of its perfection, isn’t always the easiest to understand. Break it down. Discuss, talk about real-life, apply, be accountable, always refer back to the Bible, and look to our greatest example in Christ. Share with your children how specific verses have come to serve you in your life’s work. At the end of the day, it always comes back to being active in your children’s biblical upbringing. As I said, we are made for storytelling, but—far more important—we are a PART of His story. This is the best way of Raising children, having two is a struggle to keep up! Thank you so much for this blog! I will keep this in mind all the time! Thanks a lot for “Towards Excellence” blog! Cecy has been doing an excellent work to bring those wonderful experiences from excellent persons to me through her blog. It is of much benefit to me.